U.S. Olympic gold and silver medalist Leslie Howard topped an international starting field to win the $100,000 CSI2* Synoil Energy Services Cup at the CSI2* Summer Festival held August 6 to 10 at the Caledon Pan Am Equestrian Park in Palgrave, ON. As the site of equestrian events for the 2015 Pan American Games, the CSI2* Summer Festival acted as the official observation event and inspection in preparation for next year’s games. In appreciation and recognition of the years of hard work that have gone into rebuilding the Caledon Pan Am Equestrian Park, those involved were honoured during a special ceremony held before the jump-off for the $100,000 CSI2* Synoil Energy Services Cup. 1976 Canadian Olympic individual silver medalist Michel Vaillancourt, who will handle course designing duties at next year’s Pan American Games, set the tracks throughout the week. In Thursday’s $35,000 CSI2* Henry Equestrian Plan Open Welcome, Vaillancourt’s course produced six clear rounds from the 33-horse starting field. In a thrilling jump-off, Canadian Equestrian Team veteran Hugh Graham of Schomberg, ON, chased down the time of 39.66 seconds set by Leslie Howard and Tic Tac, narrowly taking the win with Julie Firestone’s Airborne in 39.63 seconds. With Howard hungry for redemption, the stage was set for Saturday’s $100,000 CSI2* Synoil Energy Services Cup. This time, only four riders found their way around the clever track set by Vaillancourt. First back, Jonathon Millar had four faults in a time of 43.90 seconds riding Calvin Klein, a 10-year-old Swedish Warmblood gelding owned by Millar Brooke Farm of Perth, ON. Howard, who hails from Newtown, CT, was next up with Tic Tac, an 11-year-old Belgian Sport Horse stallion (Clinton x Darco) owned by Jane Clark. Not content to settle for anything less than a win this time out, Howard meant business as she worked her way around the course, stopping the timers in 39.78 seconds to put the pressure on the final two challengers. In the end, both succumbed to the pressure with Ljubov Kochetova of Russia opting for a conservative clear round with Balou du Reventon in a time of 47.44, while Millar incurred eight faults with his second jump-off contender, Star Power. Star Power is the usual mount of Millar’s father, Ian, who had left his 2012 London Olympic mount in the care of his son while he was competing at the Dublin Horse Show in Ireland. “I went second in the jump-off, following Jonathon with Calvin Klein. I watched and knew what I had to do to beat him,” said Howard. “I knew Star Power was still to come and could possibly catch me; he is a fast horse and I felt I did leave the door open a little. But I crossed my fingers and Jonathon had a rail and Ljubov was clear but slow, so it all worked out. Howard has been riding Tic Tac for the past year and a half, with the CSI2* Summer Festival marking the pair’s first competition since June. As a veteran of the United States Equestrian Team, Howard, 57, also took advantage of the opportunity to compete at next year’s Pan American Games venue. 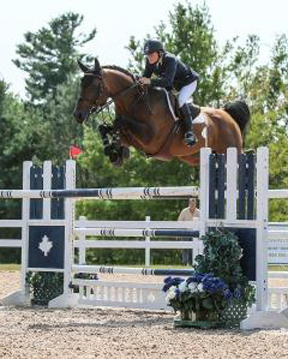 The CSI2* Summer Classic marked the fourth of five weeks of International Equestrian Federation (FEI) sanctioned competition to be held at the Caledon Pan Am Equestrian Park in 2014. The final week of FEI competition this season will be the CSI2* Canadian Show Jumping Tournament from September 24-28. Produced by Equestrian Management Group (EMG) and led by Craig Collins, who also acts as Sport Organizing Chair – Equestrian for the 2015 Pan American Games, increased prize money and opportunities to earn valuable FEI World Ranking points have attracted show jumping athletes from around the globe to Palgrave, ON, this season. For full results, visit www.equiman.com.